Tempers flared in the Tuesday night Major League Baseball (MLB) match between the LA Dodgers and the San Francisco Giants after two players became involved in an altercation, which led to a bench-clearing brawl. 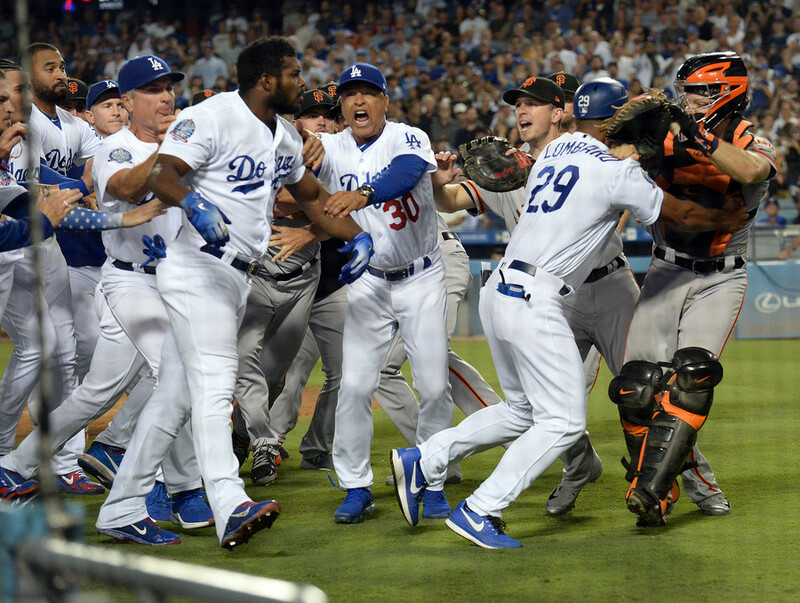 The fight started in the seventh inning between the Dodgers’ slugger Yasiel Puig and Giants’ catcher Nick Hundley, with Puig reacting in frustration after fouling from a fast pitch by Giants pitcher Tony Watson, leading to a square off between Puig and Hundley. As seen in the video, Hundley appears to have some choice words for Puig, and after a brief verbal exchange, Puig shoves the Giants catcher Hundley. A brawl ensued with players and coaches from both sides becoming embroiled in the melee, following which both instigators were subsequently ejected. "I didn’t like that he [Hundley] was telling me what to do, and then he said some words to me in English that I can’t really repeat. So that’s why I was upset," Puig told reporters after the game, AP reported. Hundley had a more subdued view of the altercation speaking after the game. "We had some words and pushed a couple times. There’s not really more to it than that," he said. The league has yet to confirm if any further action will be taken. The Giants went on to win the match 2-1.